The warm weather of spring is upon us and outdoor events abound each weekend. See below for my top picks for things to do this weekend in the Triangle. Have a tip or suggestion for next week? Send me an email at TriangleExplorer@gmail.com. The Annual Wake Forest Herb Festival returns to Festival Park in downtown Wake Forest. The Herb Fest is recognized as the largest herb and perennial festival east of the Mississippi. Organically grown herb plants and organic vegetables will be available for purchase at the Festival which also features live entertainment, local beer and educational seminars. A highlight of the festival for children is the daily “duck parade” held each day around 10:00am when a group ducks gathered up each morning waddle to their pond. In honor of North Carolina Beer Month Carolina Brewing Company will be having “A Taste of Holly Springs” at the brewery where they will be offering samples and selling CBC brews. They have also invited two new breweries that will be opening their doors in Holly Springs very soon. Bombshell Beer Company and Holly Springs Nano Brewing will be on hand pouring samples of their brews. Food trucks from Big Mike’s BBQ and Klausie’s Pizza will be on hand selling food . 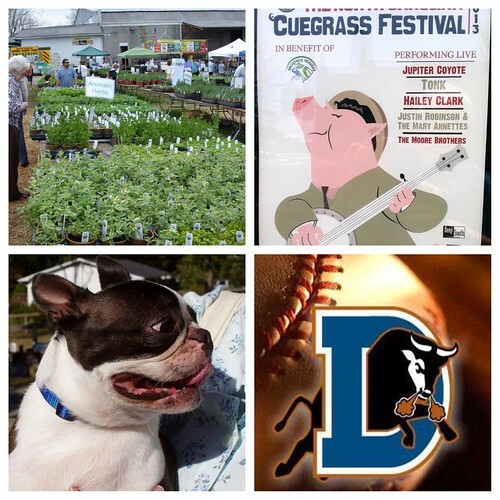 The Pit’s 5th Annual ‘Cuegrass Festival returns to the warehouse district of downtown Raleigh with a jam-packed day full of great ‘cue, local brews and toe-tappin’ bluegrass music! They”re closing down the streets around The Pit and firing up the pig cookers to serve plenty of our famous Eastern North Carolina-style barbecue and a selection of locally made beers. Featuring live music from: The Moore Brothers, Justin Robinson & The Mary Annettes, Tonk, & Jupiter Coyote. Proceeds go to the BackPack Buddies Program, which is a partnership between the Junior League of Raleigh and InterFaith Food Shuttle. Join the SPCA for the K9-3K Dog Walk to raise money for homeless pets. On Saturday, April 20 the streets of downtown Raleigh will close to make way for the largest march of dogs in city history. The walk event is fun for families, individuals and of course dogs! Join thousands of people like you who care about animals and walk to save lives. The theme for this year’s event is from The Wizard of Oz! So grab Toto, and your friends, and help us give thousands of pets a home. Apex Arts Council will hold its Artists for Animals Faire this Saturday. They will have painters selling their work, photographers, sculptors, poets, musicians, authors, dance, independent film, and perhaps even theater. The idea is to give anyone attending the event the chance to be exposed to as many art forms as possible. The event will be held at the Cloer Family Vineyards (www.CloerFamilyVineyards.com) in Apex, so you will also have the option of sampling the art of the vintner that day. Cloer has three pet beef cattle (Buttercup, Daisy, and M&M), a small flock of pet sheep, and some chickens on the property. Join the Tobacco Road Marathon, RunRaleigh Races, nOg Run Club, Raleigh Galloway, City of Oaks Marathon, NCRC, Big Boss Run Club, Blue Run Club, WFAR, Black Girls Run, WOB Run Club and many other local organizations this Sunday, April 21st for a Boston Memorial Run. They will be meeting at Tir na nOg for a 3 mile run through downtown Raleigh. Wear a race shirt in support of the runners and families. They will be collecting donations to send to those affected by bombing in Boston earlier this week. Tir na nOg will be donating 10% of all food sales. Please RSVP to this event on the facebook event. Celebrate Durham’s sense of community, raise awareness of current local and global environmental issues, actively engage in hands-on learning activities, and celebrate our environmental success. Festival goers will participate in “green” activities and demos; learn about many green practices and products at the Sustainability Expo and Earth Art Market; and enjoy great music, food and much more! Nothing beats a baseball game in the spring. If you live in the Triangle you need to go to at least one Durham Bulls game for the experience. Even if you aren’t a huge baseball fan it is still a great way to spend an evening. Ticket prices are very affordable ranging from $7 to $9 and can easily be purchased the day of the game at the box office. A popular option is to head to the game a little early and hang out at Tyler’s Taproom across the street to grab a few pre-game beers. New Business Suggestion – The New Macaroni Food Truck! You know I love local food trucks and I am super excited that just this week a new Food Truck came on the the scene. It is called “Mac-Ur-Roni” and features dishes made with…you guessed it Gourmet Mac and Cheese! They will be at Big Boss Brewery in Raleigh this Saturday from 2pm through the late evening. They are just getting up and running, but you can follow them on their website, facebook and twitter @MacUrRoniRDU to keep tabs on where they will be next. Also, the garden open house at The NC Governor’s Mansion is Saturday, 10am to 2pm. Thank you Arthur! I hadn’t heard about that one. As always, thanks for checking out my blog. Love reading yours and viewing all your great pictures too! With its hub of tourist activities, it’s no wonder why this Washoe County city has been toured by millions of travelers annually. Their commitment and high degree of professionalism ensures a hassle-free holiday experience with minimum fuss.